Pope Benedict XVI in Rome has made a plea for peace in the Middle East, as he celebrated his first Christmas Eve Mass since becoming pontiff. 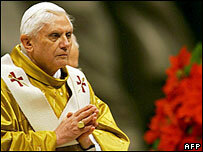 He spoke to thousands of people packed into St Peter's Basilica and watching on screens in the square outside. The Mass was broadcast live to 46 nations. Calling on Roman Catholics to think of those in Bethlehem, he said: "We wish to pray for peace in the Holy Land." The Pope began delivering his first Christmas sermon at noon (1100 GMT). In Iraq, the head of the country's Chaldean Christian church prayed for peace in Iraq and elsewhere. Ceremonies in Baghdad were held before dusk on Saturday in advance of a curfew. "I do not want to make a distinction between Christians and Muslims, we are all Iraqis," said Emmanuel II Delly. "A car bomb kills without distinguishing between Christians and Muslims." In Bethlehem, revered as the birthplace of Jesus, Latin Patriarch Michel Sabbah, the senior Catholic cleric in the Holy Land, said the region was "thirsting for peace". "God created you not to fear or to kill each other but to love each other, to build and to cooperate together," he told crowds in Bethlehem, where Palestinian leader Mahmoud Abbas was attending his first Christmas Eve service. In Rome, the BBC's David Willey says the Pope made an impassioned plea for peace in his homily on Christmas Eve. The Pope appears very conscious that this glittering ceremony is viewed by millions of people all over the world, our correspondent says. In his homily, the pontiff stressed the traditional meaning of Christmas. He went on: "On this night, when we look towards Bethlehem, let us pray in a special way for the birthplace of our redeemer and for the men and women who live and suffer there. "We wish to pray for peace in the Holy Land. Look O Lord, upon this corner of the earth, your homeland, which is so very dear to you. Let your light shine upon it! Let it know peace!" St Peter's Square was dominated by a 30m (100ft) decorated fir tree and a larger than normal Nativity scene - the latter designed to show people more clearly the lowliness of Jesus' birth, a cardinal said. Earlier the Pope appeared at the study window of his Vatican apartment, overlooking the square, and lit a candle for world peace. He will return to give the traditional Christmas message, Urbi et Orbi, to the pilgrims, tourists and the world's estimated 1.1 billion Catholics on Sunday. The pontiff is scheduled to lead an evening service on New Year's Eve and celebrate mass the next day in St Peter's Basilica to mark the Catholic Church's World Peace Day.